What is a rain garden and how does it work? Recently installed rain garden at the University of Delaware’s Louise and David Roselle Center for the Arts. Rain gardens, sometimes called bio-retention areas, are shallow depressions in the landscape that capture stormwater and allow it to gradually percolate into the soil. 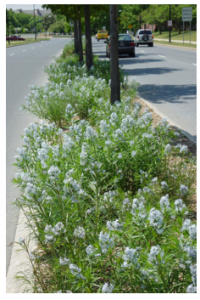 Planted with moisture-loving plants that help filter out pollutants, rain gardens provide an attractive way to reduce the impact of stormwater on the environment. Manages stormwater on site. Rainwater is captured by a rain garden instead of flowing off-site, where it picks up pollutants on paved surfaces before flowing into storm drains and then into natural water bodies. Rain gardens reduce flooding and erosion associated with large amounts of stormwater entering streams during heavy rainfalls. Helps recharge the water table. By capturing water and allowing it to percolate into the soil, rain gardens help replenish local aquifers. Filters out pollutants to reduce contamination of groundwater. Ongoing research suggests that rain gardens can be quite effective at filtering out some of the most common pollutants in stormwater, including chemicals, metals, fertilizers, and pesticides. Charged soil particles can attract and absorb metals and chemicals; microorganisms decompose pathogens and organic litter; and plants can filter out and utilize the nitrogen and phosphorous contained in fertilizer runoff. Delights the senses. The diversity of plant textures, colors and fragrances possible in rain garden plantings can enhance the appearance of a home landscape. 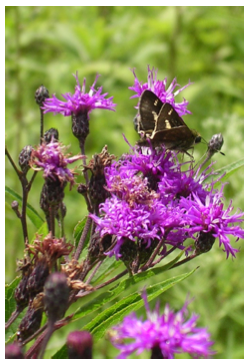 For more information about how people benefit from gardens, consult the fact sheet “Human Benefits of Green Spaces,” available at http://www.ag.udel.edu/udbg/sl/humanwellness.html. The best place for your rain garden is on gently sloping ground where stormwater drains off impermeable surfaces or turf grass, such as the downhill side of a patio, driveway, or lawn. You can also site it in a location 10–30 feet away from your building where flexible piping can be used to direct the flow of your downspouts. Do not locate a rain garden in a low spot on the property that drains poorly. Poorly drained areas may not support sufficient plant growth to function as a rain garden. A rain garden must have level sides to effectively capture water; a flatter slope requires less digging. Slopes of 1-10% are ideal. Orient your rain garden so the long side is perpendicular to the slope—this will maximize the amount of runoff captured. Building code requires any water retention device, including rain gardens, to be located at least 10 feet from any building as a guard against flooding. Also avoid building your rain garden over a septic system, or where the seasonally high water table is less than 2 feet from the surface. Any time you dig in your yard, you also need to confirm the location of underground utilities; in Delaware you can call Miss Utility at 1-800-282-8555. Finally, try to locate your rain garden in an area that receives full to partial sun, as most plants that do well in rain gardens are sun-lovers. There is, however, a limited selection of rain garden plants that can tolerate shade. The surface area of your rain garden will depend on the rain garden’s depth, the size of the area from which you are capturing runoff, and your soil type. Typically, rain gardens are roughly 10-20% the size of the source area; several smaller gardens may be used in lieu of one big one. Even if you do not have enough space for rain gardens that treat all of your site’s run off, remember that every bit helps—a rain garden is 30% more effective at draining runoff than a turf area of the same size. Runoff area = surface area of the area that the runoff will be draining from; for example, the size of your rooftop, driveway, patio, or sloping lawn. Depth of runoff = average amount of rainfall in a storm. For most storm events in the Mid-Atlantic region, the rainfall is less than 2 inches. 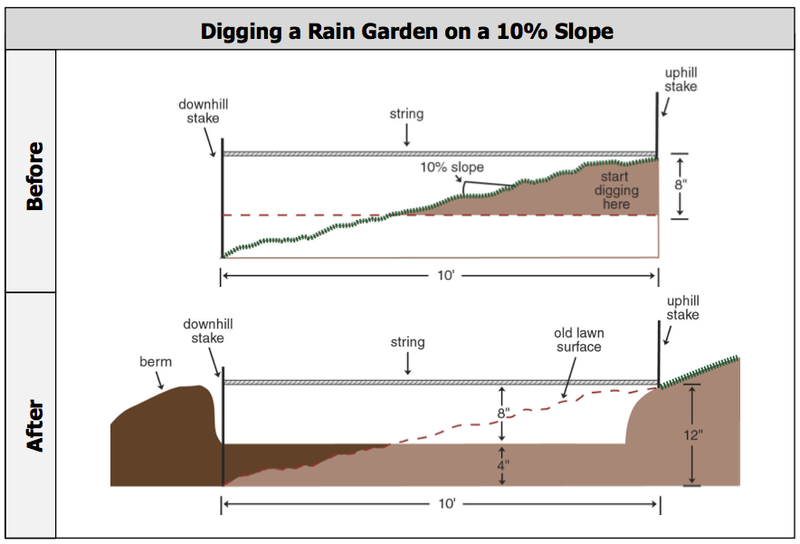 Rain garden depth: Recommendations for rain garden depth ranges from 3 inches to 12 inches. The deeper the rain garden, the smaller the required surface area required. 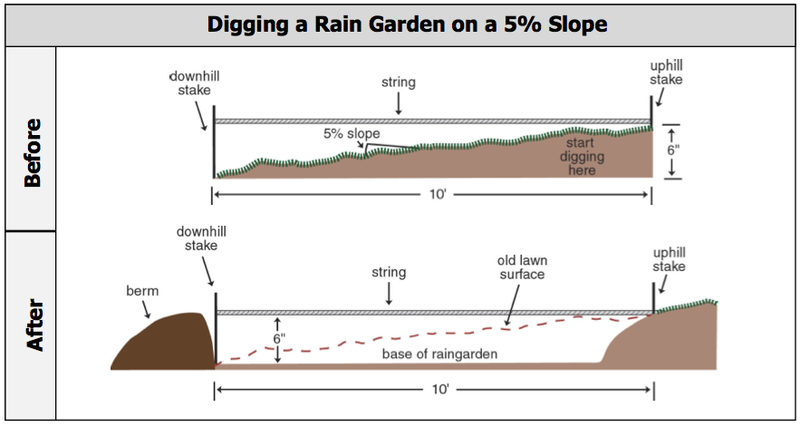 Note that a larger slope will require deeper digging for the rain garden to be level. 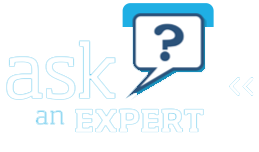 Site preparation depends largely on the soil type of your site. In sandy or well-draining loamy soil, you simply need to dig a level-bottomed depression with gently sloping sides. Use the excavated soil to build a berm around the garden, leaving an opening on the uphill side where runoff will enter. Two stakes with a level string tied between them can serve as a guide for creating a level-bottomed depression on sloped ground. Consult the drawings on the next page for more information about digging a rain garden. Clay soils or compacted, poorly draining soils often require more intensive excavation to be effective. Excavate or till to 3 or 4 feet, and fill partway with a layer of coarse gravel. Then, cover the gravel with a layer of permeable filter fabric, followed by sandy, free-draining soil and then a top layer of topsoil. Incorporating compost into the topsoil provides nutrients and added drainage capabilities. As you would prepare any garden bed, perform a soil test and add nutrients as needed. Consult the Sustainable Landscapes: Soils page at http://www.ag.udel.edu/udbg/sl/soils.html for more information on sustainable soil practices. Rain garden plants must be able to tolerate not only moisture, but also drought, as the rain garden is designed to drain water quickly. For this reason, many plants typical to wetland environments are not appropriate for a rain garden. 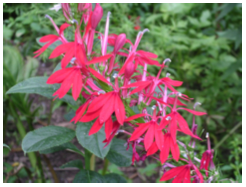 Hardy herbaceous perennials are most commonly used, through a variety of shrubs and trees also perform well in rain garden conditions. 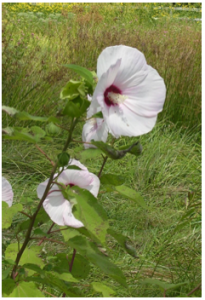 For specific plant recommendations, consult the list at the end of this fact sheet. Mulching. After planting, apply mulch at a depth of at least 2 inches to preserve soil moisture, suppress weeds, and reduce erosion. Shredded hardwood mulch is an effective, attractive option; be sure to avoid mulches that float (for example, pine bark). As your rain garden matures, maintain the protective layer of mulch, adding more as the lower layers decompose. Research has shown that over time, decomposing mulch helps maintain the pollutant-absorbing properties of the soil. Eventually, the plants may grow together and mulch will no longer be needed. Watering. Until the plants become established over the course of a few months, the garden will need to receive thorough watering at least twice a week by either rainfall or irrigation. More water may be needed in hot summer weather. With proper plant choice to fit your climate conditions, the garden will require no supplemental irrigation after the initial establishment period, except perhaps during extreme drought. Weeding. Control for weeds until good plant cover is established. Pruning and other maintenance. 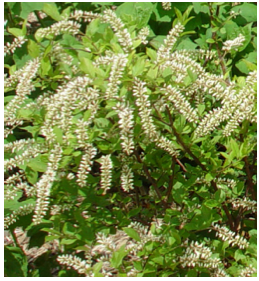 Prune shrubs to remove dead stems or rejuvenate plants such as red twig dogwood whose new growth is more desirable. 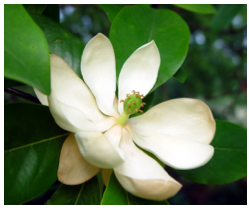 Proper plant selection should limit the need for much pruning. In late winter/early spring (before new growth begins), perennial stems from the previous season can be cut within a few inches of the ground. Bannerman, R. and E. Considine. (2003). Rain Gardens: A How-to Manual for Homeowners. University of Wisconsin– Extension and Wisconsin Department of Natural Resources. Retrieved November 10, 2008 from http://clean-water.uwex.edu/pubs/pdf/home.rgmanual.pdf. Hunt, William F. and Nancy White. (2001). 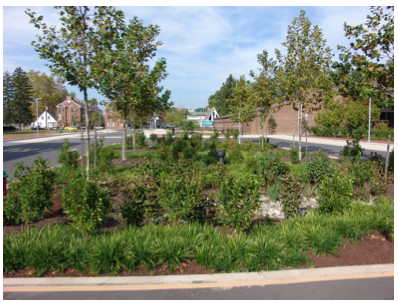 Urban Waterways: Designing Rain Gardens (Bio-Retention Areas). North Carolina Cooperative Extension Service. Retrieved November 10, 2008 from www.bae.ncsu.edu/stormwater/PublicationFiles/DesigningRainGardens2001.pdf. Miss Utility of Delmarva. (2008). Miss Utility of Delmarva. Retrieved November 10, 2008 from http://www.missutilitydelmarva.com/. Obropta, Christopher, William J. Sciarappa, and Vivian Quinn. (2006). Rain Gardens. Rutgers Cooperative Research & Extension. Retrieved November 10, 2008 from www.water.rutgers.edu/Fact_Sheets/fs513.pdf. Potomac Conservancy and Montgomery County Department of Environmental Protection. Rainscapes: Harvesting the Heavens. Retrieved November 10, 2008 from http://www.montgomerycountymd.gov/Content/DEP/Rainscapes/pdf/harvesting.pdf.